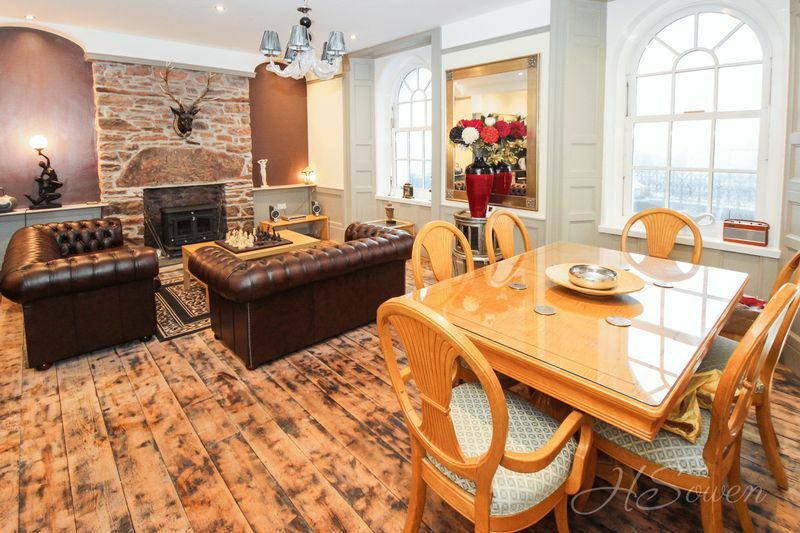 A substantial detached property formerly a Vicarage dating back to circa 1823, having undergone refurbishment with glorious character features throughout. 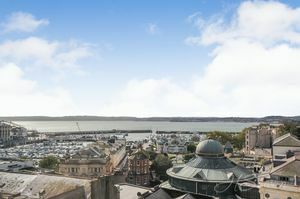 This prestigious residence sits in an elevated position set back from Torquay Harbour Side with spectacular panoramic coastal views. 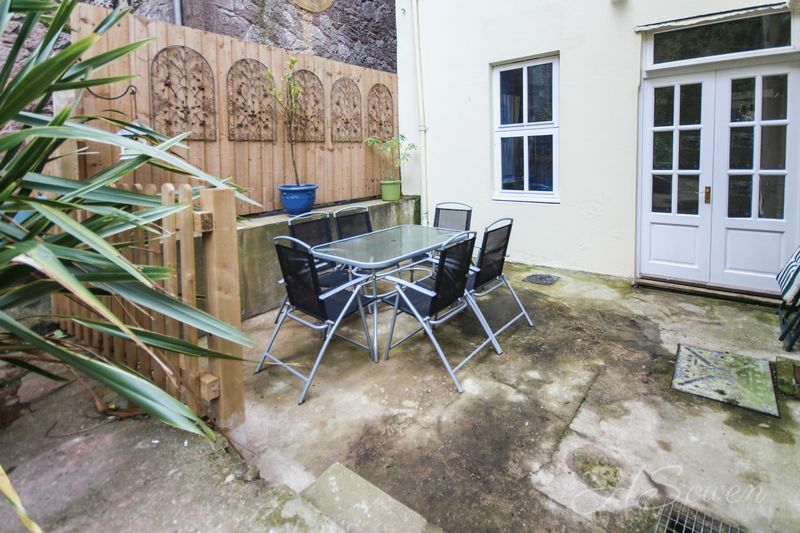 Wrought iron gates give access to an extensive amount of off street parking, a rarity in this road with the potential to create a fantastic podium sun terrace (STPP). 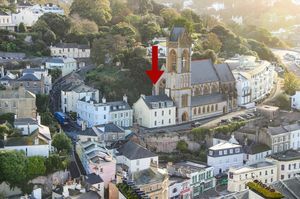 Character features have been retained and renovated including exposed limestone stonework, quarried from the neighbouring cliff face. 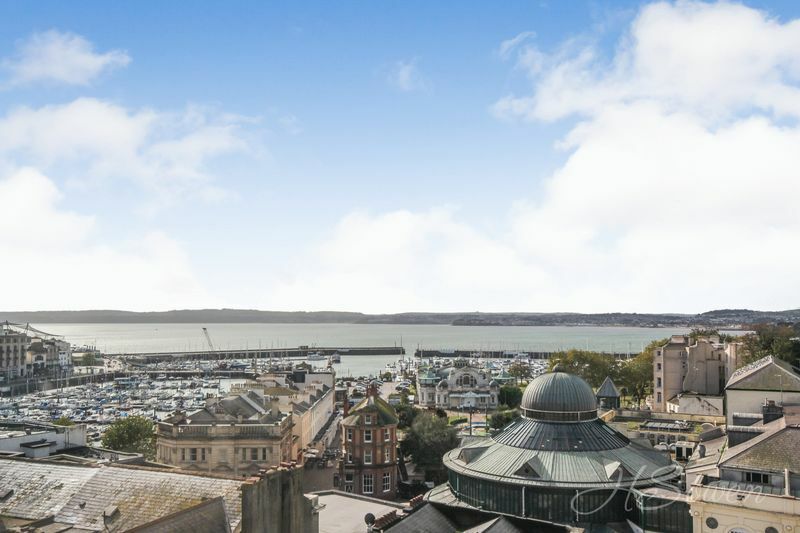 This unique property is arranged over three floors, and provides flexible living accommodation, future proofed to be easily converted to two stand-alone flats to the ground floor (STPP). It comprises briefly of seven bedrooms in total, two open plan kitchen/living/dining rooms, a laundry room and five luxury bathrooms. 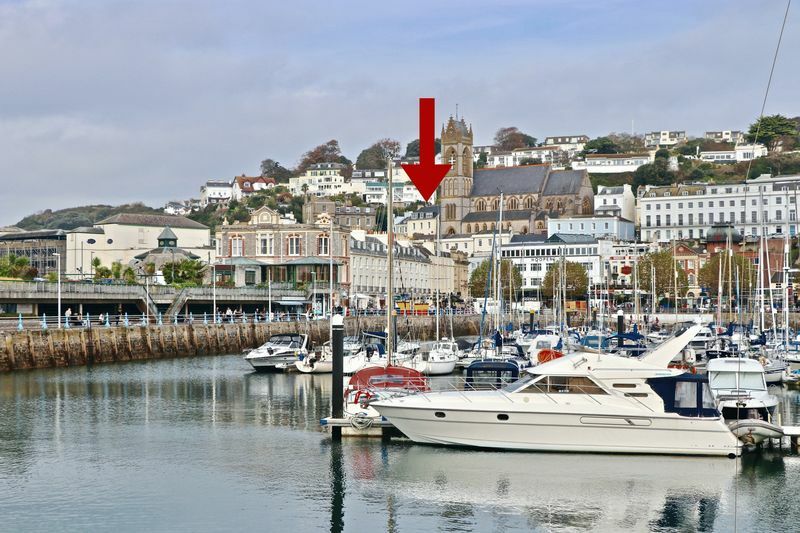 Viewing is highly advised to fully appreciate this intriguing property. At street level a wooden front door to the side elevation with brass door furniture leads you into the entrance hall with original Herringbone timber floor. From here you have access to all rooms of the ground floor. The open plan kitchen/dining/living room is an impressive versatile space with room for a good-sized dining table. A feature fireplace with slate hearth and exposed stonework chimney breast provides a welcomed focal point the living area. In keeping with the character of the property wooden panelling has been restored to dado rail height matching the colour scheme of the newly fitted kitchen units. The kitchen has been fitted with a delightful ceramic Belfast sink and an electric oven with a four-ring hob over. 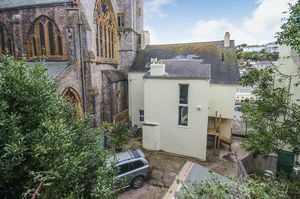 There is space and provisions for a washing machine and a second internal door leading to the lobby with a double glazed French doors leading to the rear courtyard of the property. 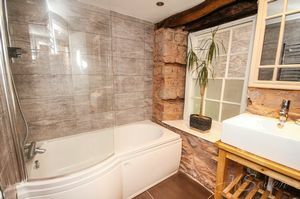 Adjacent to the kitchen is a stylish wet room. 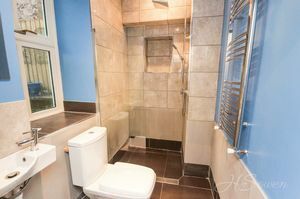 Providing modern day convenience this room is fitted with a walk-in shower with glass screen, a low level WC and a wall mounted wash hand basin. An obscure double glazed window to the rear elevation allows for good ventilation and natural light. The wet room is finished with feature tiling to the walls and floor and a chrome ladder style heated towel rail. 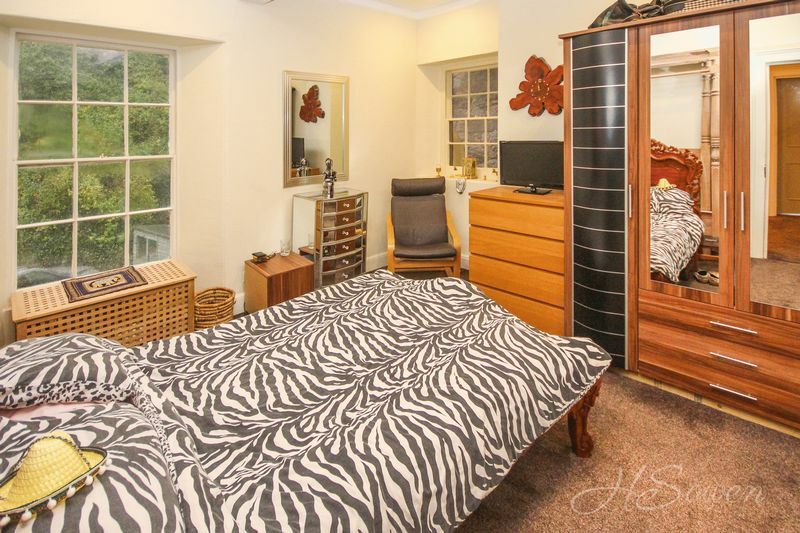 To the rear elevation of the ground floor accommodation you will find bedroom six/formal dining room. 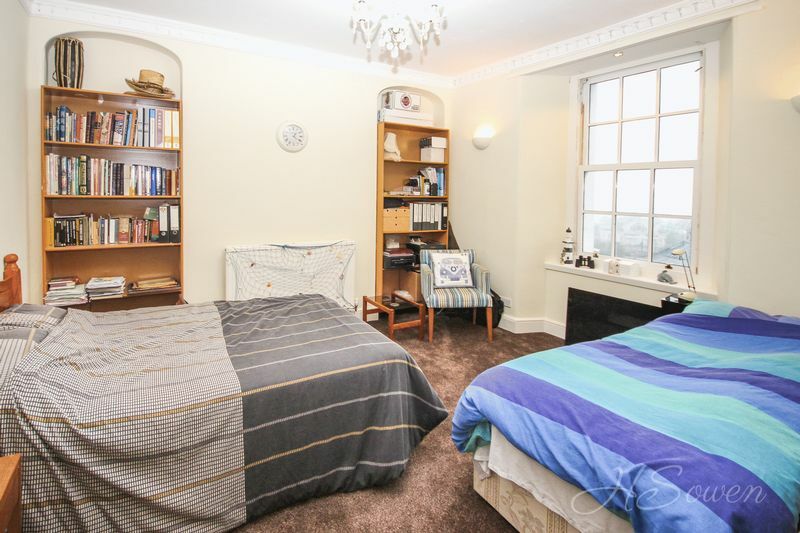 Offering flexible uses, this room is of good-size carrying through the wonderful features of this period property. 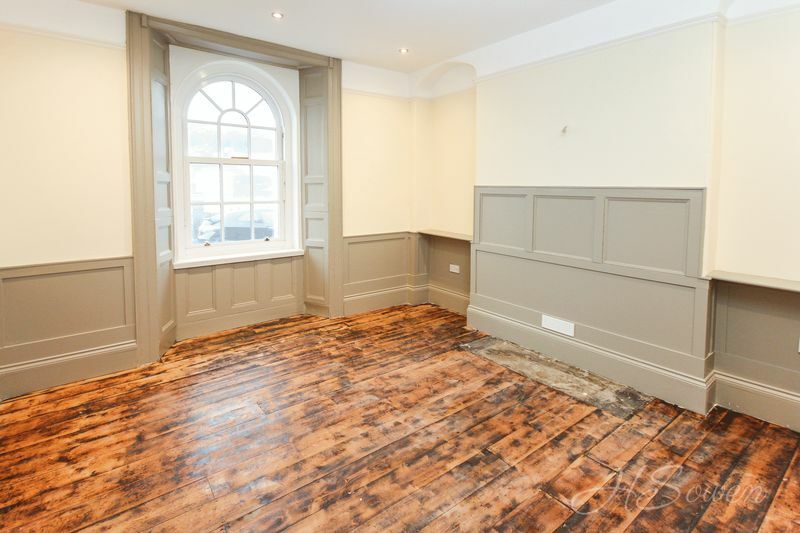 Wooden panelling in keeping with all principal rooms to the ground floor lines the walls to dado rail height with exposed stonework providing a feature wall. There are two built-in work tops and a fitted ceramic sink. This room also benefits from two built-in cupboards with pipework capable of fitting a separate boiler, allowing you to turn the ground floor into self-contained accommodation (STPP). Finishing off the ground floor you have bedroom seven, again with comparable decor as shown throughout the ground floor with character features and fantastic height ceilings. Situated behind wrought iron double gates, an external staircase leads you to the front door of the main house entering the second level of the building. The entrance hall gives access to fours bedrooms, two bathrooms, a study area and stairs rising to the third floor. There is a built-in double cloaks cupboard to your right and further storage facilities by way of an under-stairs cupboard. Straight ahead of you is a bathroom oozing character features with exposed stonework and wooden beams. Newly fitted it comprises of a 'P' shaped panelled bath with a shower over, a ceramic wash hand basin with shelving below and a low level WC. Finishinbg touches include quality tiling to the walls and floor and a chrome ladder style heated towel rail. Making your way further into the property a few steps of which previously formed part of a staircase leading to the ground floor, opens out on the main landing. 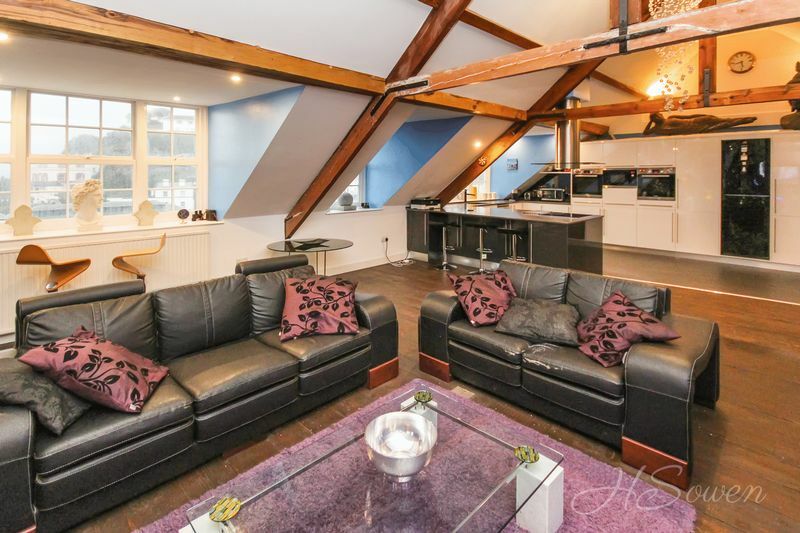 To the ceiling you will find a real feature this period property boasts. A delightful atrium with restored detailing providing an essence of granduer. Flooding the landing with natural light and feeding up from the third floor it is accompanied with exposed stonework to a feature wall and a picture window from the living space above. 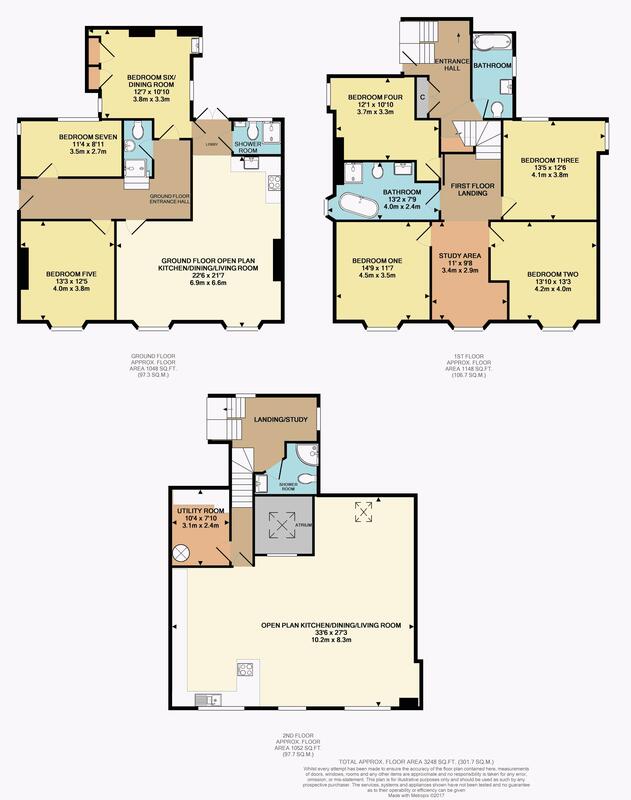 The main landing has a fantastic study area which could potentially be divided to provide an additional bedroom or home office. 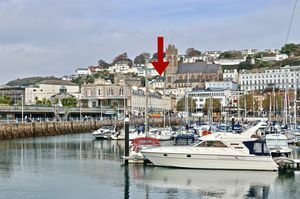 A double glazed sash window to the front elevation allows for yet more natural light to flow through as well as providing a glorious outlook over the marina and coastline beyond. Bedroom four is a good-sized room with a unique shape allowing space for a double bed and additional bedroom furniture. 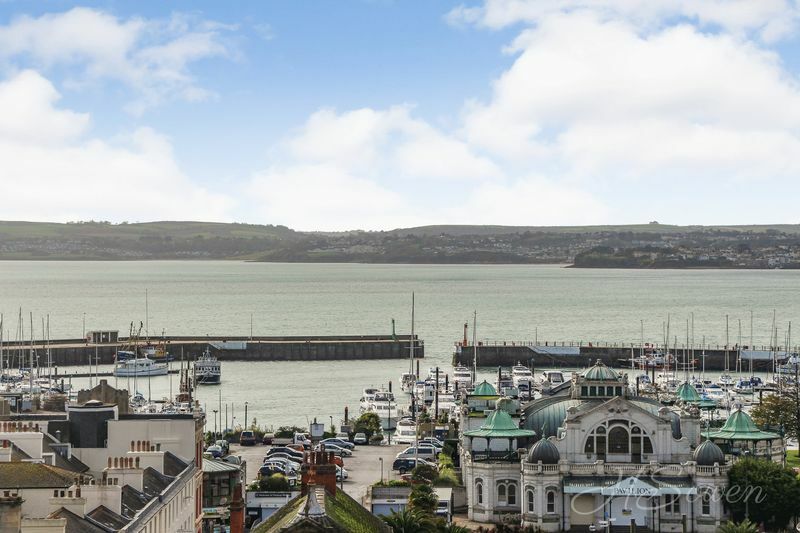 The remaining three bedrooms are all fantastic sized rooms with decorative coving to the ceiling with bedrooms one and two boasts spectacular views of the marina, coastline and across the surrounding area. 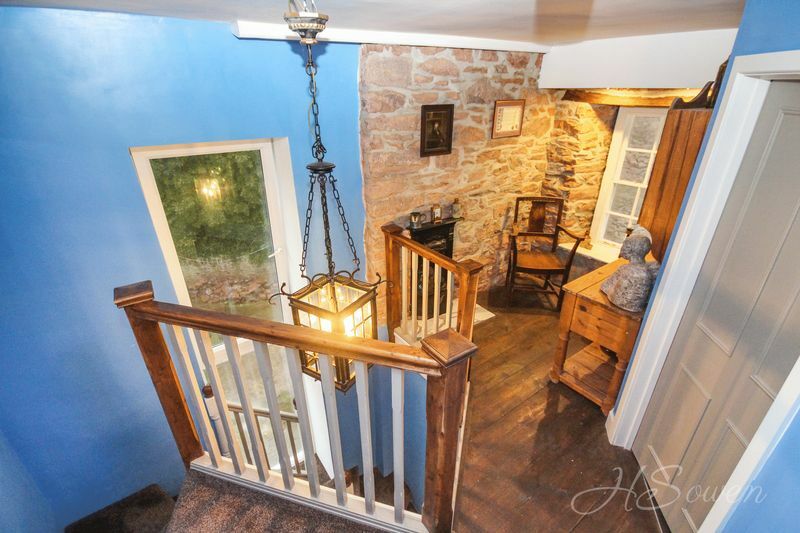 Taking the stairs, the glorious staircase turns carrying you through to a half landing with a large double glazed window creating a bright space with a unique snug/study area. Again exposed limestone to the walls here add to the very essence of this property with a feature fireplace in-situ. From here you also have access to a shower room. 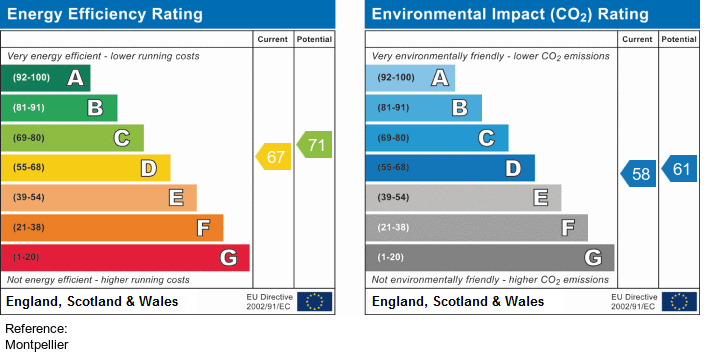 It comprises of a corner shower cubicle with mains shower and body jet spray, a low level WC and a wash hand basin. Carrying on through the third floor landing, to your right you will find the plant/laundry room. Spacious in size it houses the gas fired central heating boiler and the hot water pressure cylinder. It also doubles up as a fantastic laundry room, with the facility and space to accommodate a washing machine and a tumble dryer beneath the fitted work top. Last but not least, occupying the full width of the property to the front elevation is the breathtaking open plan kitchen/living/dining room. 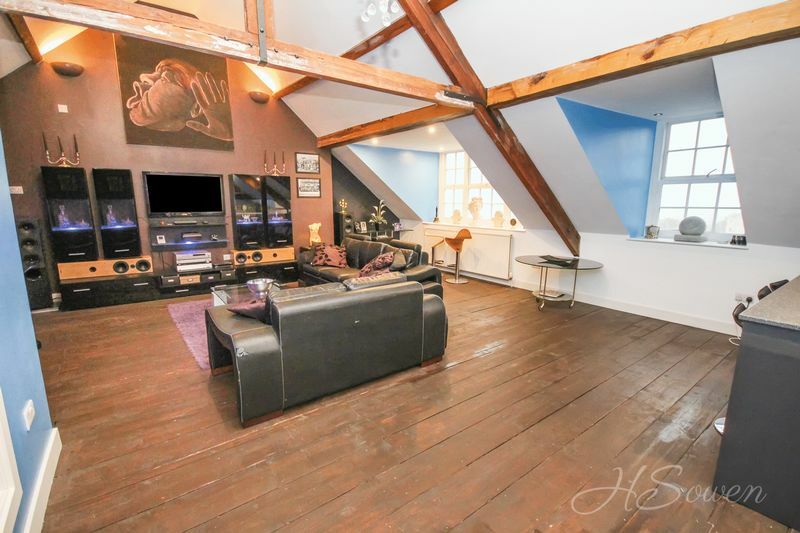 Measuring in at over 33ft in length, this impressive room is the true heart of the home. Exposed beams to the ceiling and spectacular views provide a charming setting in this superb house. The luxury fitted kitchen is of impressive design with white gloss fronted units to two walls accompanied by Mistral work tops extending to provide a sizeable breakfast bar. 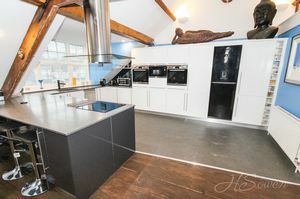 The breakfast bar incorporates a pop-up power point and the modern induction hob with a contemporary cooker hood above. 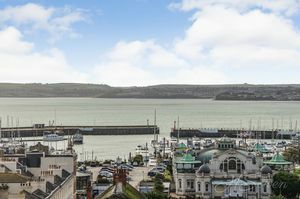 The sink unit has been wonderfully positioned below a double glazed window allowing for awe-inspiring marina and views over Tor Bay with the coastline beyond. The kitchen is also fitted with a 'Smeg' dishwasher, two eye-level ovens, and integrated microwave and a fitted fridge/freezer. The living/dining area has wooden flooring and boasts two wide double glazed windows with deep sills allowing for similar stunning views of that to the kitchen. An additional velux window to the rear elevation provides additional natural light over the dining area. 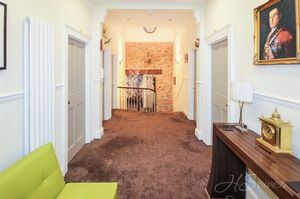 The picture window, situated between the kitchen and living room area is a delightful addition to the property, looking across to the limestone feature wall of the second floor landing with the atrium creating a tunnel of light. The property boasts an abundance of off street parking, a rarity in the area. Situated behind double wrought irons gates is a hardstanding, capable of accommodating multiple vehicles. There is a CCTV system in place and a telephone entry system. To the hardstanding there are also two outdoor sheds/workshops providing a variety of uses and storage facilities. There is potential to create a podium sun terrace above the hardstanding, without losing the parking area (STPP). 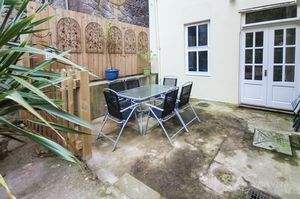 There is also an outside seating area with french doors leading into the ground floor to the property. Providing convenience is an outside tap and a double outdoor power socket. 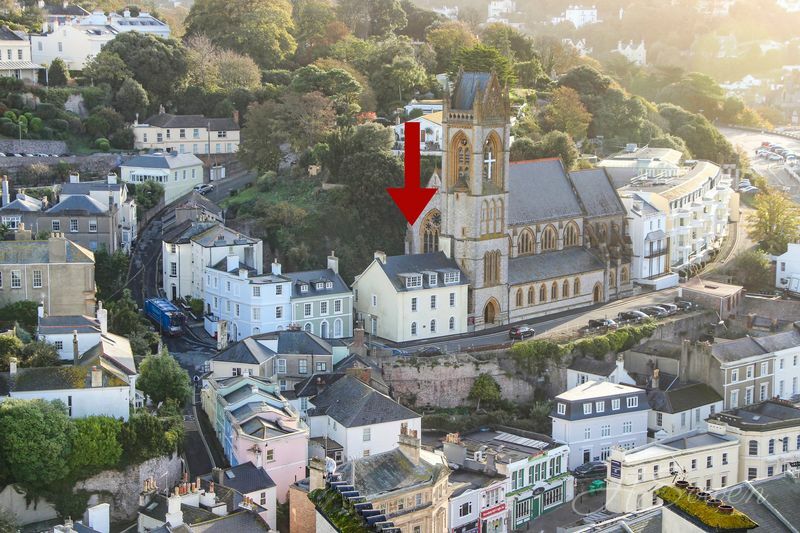 Additionally there are original steps leading to small terrace in cliff face. Period style front door with brass door furniture and peep hole. Wall mounted radiator. Original Herringbone timber flooring. Spotlights. Decorative panelling to dado rail height. Arched double glazed sash windows to front elevation. Inset ceiling spotlights. Wall mounted radiator. Picture rails. Power points. Built-in shelves. Wooden flooring. 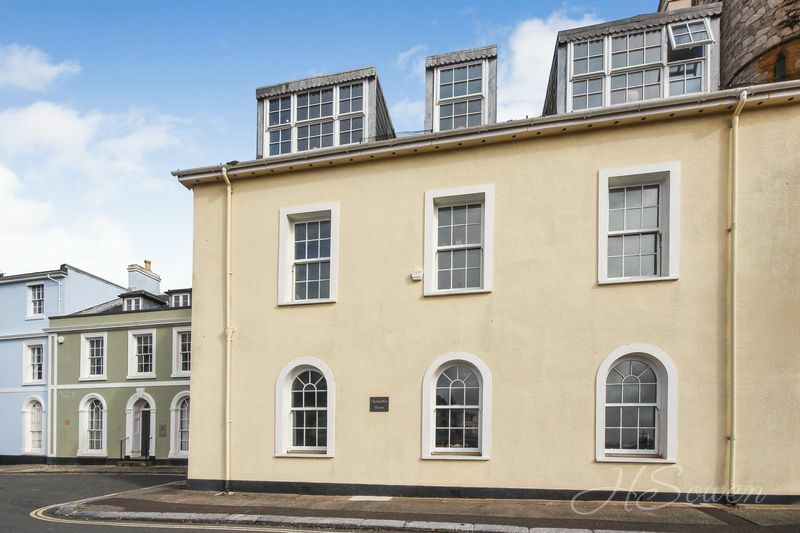 Living/dining area: Two arched double glazed sash windows to front elevation. Decorative feature panelling to dado rail height. Feature fireplace with exposed stonework and slate hearth with built-in shelving to either side. Inset log burner. Picture rails. Wooden flooring. Two wall mounted radiators. Inset ceiling spotlights. Power points. 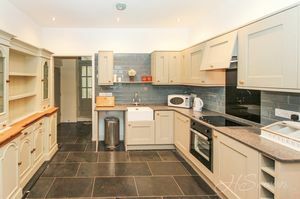 Kitchen: Slate tiled flooring to kitchen with tiling to splash backs. Modern fitted wall and base units with bottle rack and roll edge Mistral work top over. Ceramic Belfast sink with mixer tap over. Space for washing machine. Electric oven with four-ring ceramic hob over and integrated extractor hood.Integrated refrigerator. Inset ceiling spotlights. Smoke alarm. Walk-in shower with glass screen and mains shower. Low level WC. Wall mounted wash hand basin. Obscure double glazed window with deep tiled sill. Chrome ladder style heated towel rail. Part tiled walls. Tiled floor. Slate tiled flooring. Wall mounted radiator. Two recess' with built-in work-tops. Ceramic wash hand basin. Feature panelling to dado rail height. Two built-in storage cupboards. Two single glazed windows and a double glazed window. Decorative exposed stonework. Beam to ceiling. Power points. Smoke alarm. Low level WC. Wash hand basin. Shower cubicle with mains shower. Tiled flooring. Two single glazed windows and a double glazed window. Wall mounted radiator. Feature wooden panelling to dado rail height. Power points. Inset ceiling spotlights. Steps lead to door. Giving access to first floor landing. Under-stairs storage. Double built-in cloaks cupboard. Exposed stonework with wooden beam. 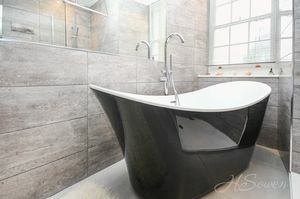 'P' shaped panelled bath with shower over and glass shower screen. Rectangular ceramic wash hand basin with shelving below. Low level WC. 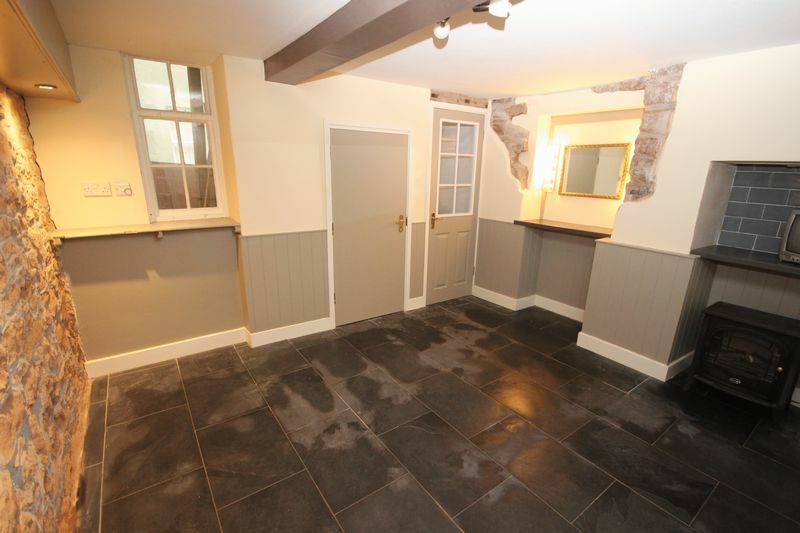 Mostly tiled with exposed stonework to one wall. Tiled flooring. Exposed wooden beam. Part obscure sash window to side elevation. Chrome ladder style heated towel radiator. 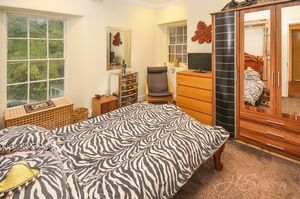 Access to four further bedrooms and opening into study area. 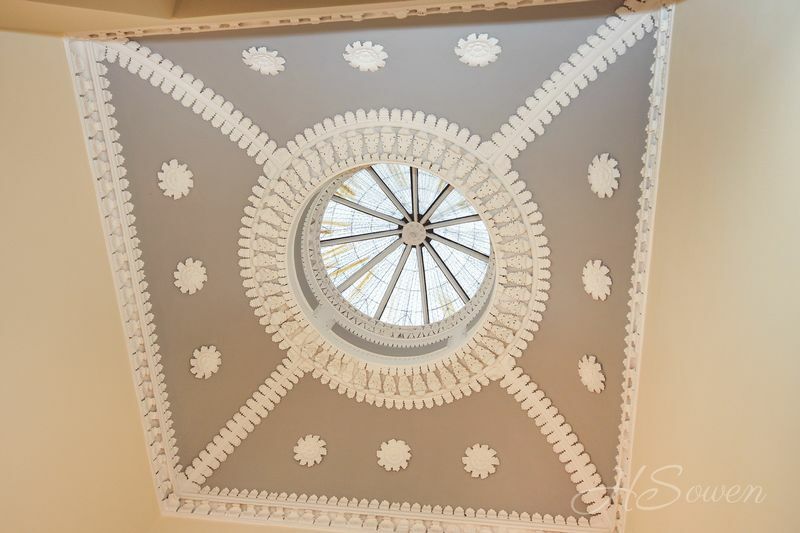 Decorative feature atrium with detailing surround to concave window to ceiling. Exposed stonework. Smoke alarm. Dado rails. Power points. Dual wall lights. Double glazed sash window to front elevation. Contemporary style wall mounted radiator. Decorative cornice work. Dado rails. Power points. Double glazed sash window to front elevation. Wall mounted radiator. Two arched recess'. Decorative coving to ceiling. Power points. Double glazed sash window to front elevation. Wall mounted radiator. Power points. Two arched recess'. 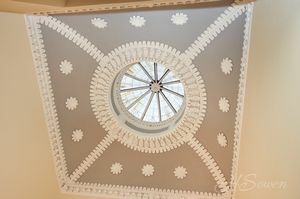 Decorative cornice work to ceiling. Dual wall lights. Wall mounted radiator. Dual aspect sash windows to rear and side elevation. Power points. Coving to ceiling. Inset ceiling spotlights. Wall mounted radiator. Power points. Sash window to side elevation. Walk-in rain-shower with glass screen, low level WC. Large wash hand basin with vanity unit below and mirror above. 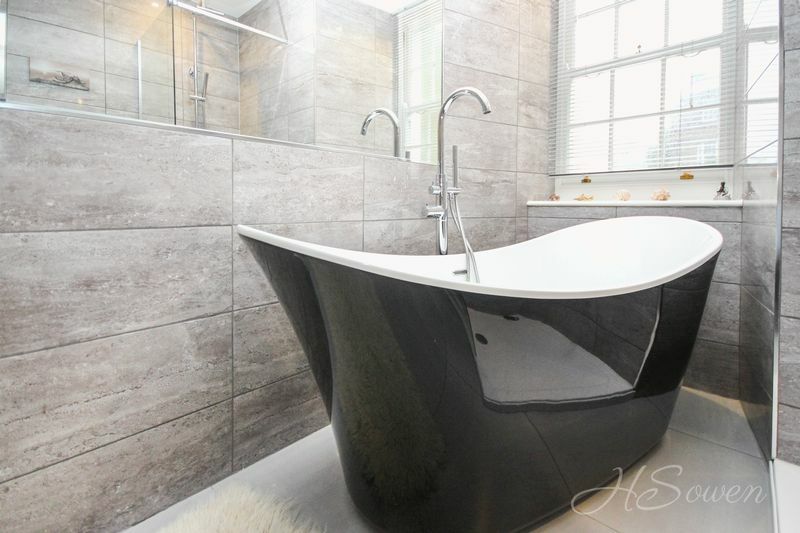 Double freestanding bath with freestanding central mixer tap and shower attachment. Chrome ladder style heated towel rail. Fully tiled walls and floor. Sash window to side elevation. Extractor fan. Inset ceiling spotlights. Sash window to side elevation. Floor to ceiling height double glazed window to rear elevation. Feature fireplace. Exposed stonework and beam with inset ceiling spotlights. Wooden flooring. Corner shower cubicle with jet body spray function. Low level WC. Wash hand basin. Feature exposed stonework. Part tiled walls and tiled floor. Worktops to two sides. Space/provisions for washing machine and tumble dryer. Power points. Hot water pressure system. Gas fired central heating boiler. Kitchen: Contemporary fitted kitchen with gloss fronted wall and base units to two sides with Mistral work top over extending to breakfast bar with pop-up power points. 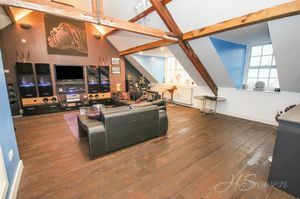 Exposed beams to ceiling. Double glazed window to front elevation with deep sill. Two eye-level ovens with fitted microwave in-between. Fitted fridge/freezer. Four-ring induction hob to work top with stainless steel cooker hood over. Inset sink unit with mixer tap over. Integrated Smeg dishwasher. Wall mounted radiator. Telephone entry system. Two wall mounted wall lights. Living/dining room: Wooden flooring. Wall mounted radiator. Two double glazed windows to front elevation with deep sills. Velux style window to rear. Picture window to first floor landing. Power points. Two wall mounted lights. Terrace seating area. Outside tap. Double outdoor power socket. Gated entrance to hardstanding providing parking facilities. Two sheds/workshops. Steps leading to small terrace in cliff face.